Call To Get Computer Tech Support! With a few simple clicks, you’ll be able to find the errors on your PC! Easy Speed PC is simple to use and can solve several problems with your computer. Does your computer freeze up and crash? Is your computer slow to start up and respond? Do you need extra privacy protection? Because your computer’s registry ensures the stability of your operating system, altering any registry entries can be a risky process due to the accidental removal of your system’s vital files. However, using Easy Speed PC minimizes this risk, allowing you to easily remove unwanted or corrupted registries and easily restoring deleted registries in the event of a mistake. 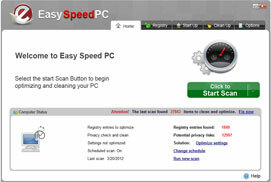 Use Easy Speed PC’s simple controls and tools to identify file conflicts and problems with your PC. Unknown and unresolved issues can plague computer performance and ultimately cause your system to fail. Track system changes and statistics with Easy Speed PC’s reports and data. Check to see which changes were made and the improvements that came from Easy Speed PC’s alterations. Use the software to bring optimal performance back to your computer! Deep clean your computer now with a fast, simple to use program like Easy Speed PC. The name says it all!